"A highly professional company throughout, we were extremly impressed by the installation team and would certainly recommend them!" 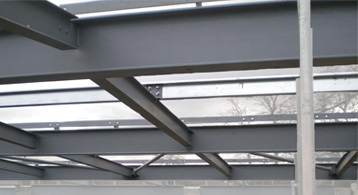 Whatever the size of the structural steelwork, from a small supporting RSJ, a new extension or a complete new building framework; Whitten Metalworks can provide the expertise to ensure from start to finish the project goes as smoothly as possible. We can provide a competitive quotation from Architects or Engineers drawings or by visiting the site ourselves. All our projects are overseen by our experienced project managers, and when required full AutoCAD drawings can be provided for your approval prior to fabrication. Once on site, your structural steelwork will be installed quickly and safely by our team of highly trained fitters who will ensure the highest level of professionalism in maintained at all times, whilst complying fully with all site rules and health & safety regulations. If required, we are also more than happy just to supply and deliver the steelwork to you, either way we will still ensure the upmost quality in the service you will receive. We can from concept drawing and artists impressions transform ideas into workable and practical reality. We will, if required, provide full working drawings by our team of experienced draughtsmen for approval which shows all aspects of the proposed items. Once approval is received the drawings go into our works for fabrication with all aspects throughout fabrication to installation project managed to completion. Once fabricated we supply a full fitting service so you the customer has complete peace of mind as your ideas become reality. Our fitting teams have over 20 years of experience and observe all health & safety guidelines so you can rest assured your installation will go safely & easily.